So you’ve finished painting. Now what? You’ve just finished painting your masterpiece. A magnificent oil painting that you want to hang in your living room or even a museum for the rest of your life. All of a sudden, you begin to notice all the dust, dirt and pollution that your masterpiece needs to be protected from. But what can you, a simple artist do about it? Gamblin Oil Paints‘s new powerpack containing both the Gamsol quality solvent/medium and the Gamvar conservation quality varnish for oils is a great way to protect and preserve your paintings. Gamsol is the safest solvent for thinning oil colors, modifying paint mediums and studio clean up. 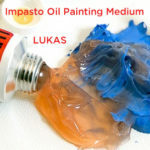 It works wonders for cleaning thick paint out of brushes and other painting tools. Gamvar on the other hand is the miracle varnish that protects and conserves your work much, much faster than most varnishes. Varnish is the first defense against dirt, dust, direct and chemical pollution trying to attack your paintings. Most final varnishes will not be finished for 6 to even 12 months. Gamvar allows you to varnish your paintings as soon as the paint has dried on your canvas or as little as just 2 weeks. It can help your paintings look beautiful sooner and can homogenize the final appearance of your painting, making it equally glossy or matte across the entire canvas or board. Gamblin uses a special formula with Gamvar and has added a synthetic and elastic replacement to Damar, which is inelastic. The effect is that when the painting dries, the varnish moves with the paint film so there is no problem with the paint cracking. Gamvar can also give your colors more depth and is virtually odorless so its much less unpleasant to deal with compared to other varnishes. It was developed in association with the National Gallery of Art so every varnish with Gamvar is a museum quality varnish. 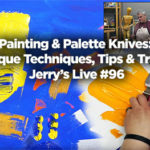 Your painting is safe from dirt, dust and pollution now, but your paintbrushes and palette knives are covered with paint still, and you want to be able to reuse them. Gamsol is the best solvent for cleaning your studio tools. While most solvents and mineral spirits are dangerous to touch and petroleum based mineral spirits even release harmful vapors, Gamsol is both odorless and non-hazardous. 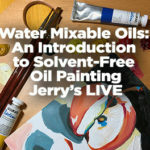 It’s the safest solvent available and can clean the stickiest and thickest oil paints and mediums right out of the brush. So when you’ve finished your painting and are ready to protect your work and restore your brushes and tools to a like-new quality, Gamvar and Gamsol will be there for you. And now, exclusively at Jerry’s Artarama, the Gamblin 32 oz Gamvar and Gamsol Power Pack is available. 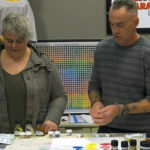 Two of the most important cleaning and preserving tools you can have in your art studio are now available together for a special low price. 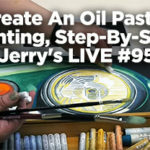 So check them out today and paint and varnish your oil paintings with confidence!